The tiny hairs on the abdomen of a cricket have inspired researchers at the University of Twente, to make a new type of sensor which is ultra sensitive to air flows. 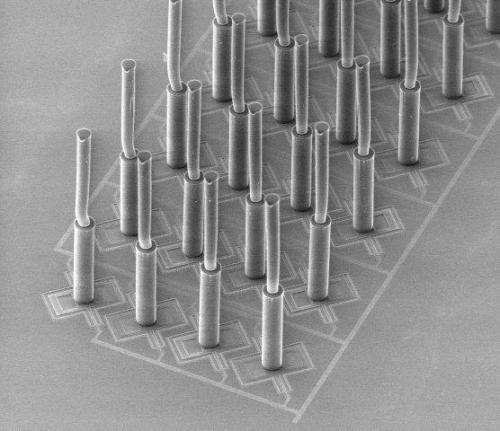 These synthetic cricket hairs can now also be tuned very precisely for a certain range of frequencies: the hairs are 10 times more sensitive in this range. The researchers of the MESA+ Institute for Nanotechnology are presenting these new results in the scientific journal Applied Physics Letters. Just as you always hear your own name if it is spoken at a busy gathering, these synthetic cricket hairs also suddenly become more sensitive to a specific frequency of air flow. The hair itself does not have to be modified for this, the enhanced sensitivity is achieved by adjusting its spring stiffness electronically. An array of artificial cricket hairs. 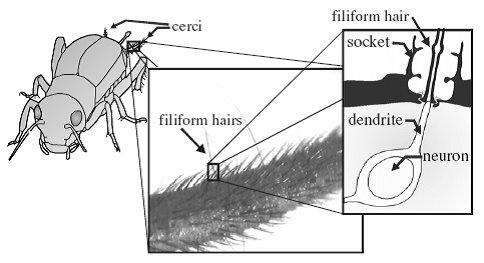 The synthetic cricket hair is an example of biomimicry, the hairs on a crickets abdomen  on the projections known as cerci - form the source of inspiration. These hairs enable the cricket to feel/hear the approach of its enemies and estimate their distance and direction unerringly. These characteristics can be simulated by making a hair that is suspended in a flexible microsystem. The hair is made of polymer SU8, is 0.9 millimetre in length and is thicker at the base than at the top. The smallest movements are registered by the flexibly-suspended plate to which the hair is attached; the electrical capacity changes as a result and gives a measure for the movement. You could enhance sensitivity by using another type of hair that is not as stiff, but Harmen Droogendijk discovered that it is also possible to adjust the spring stiffness of the hair in question electronically. He investigated the alternating voltage needed to get the hair, or spring, limp at the required moment, thus making it extra sensitive to the related frequencies. The effect is substantial: a hair is 10 times more sensitive at the adjusted frequency. This makes the sensor more easily applicable without having to alter the design. Potential applications include direction sensors used by robots and the study of very specific air flows. In the longer term, the synthetic hairs could also be used in hearing aids. The hairs can be made extra sensitive to certain frequencies in all these applications.